These belts are exclusively made by our experienced artisans. Since they are hand braided every piece is exclusive on its own. Truly a niche product from our factory. Women Braided Leather Belt. Customization entertained. Description: It is made by Handmade Braided Leather Belt. Available colors are Black, Brown and Tan.. Specifications: Leather Belt is engineered to be thinner, lighter, and stronger than any other belts available. The material makes it virtually tear proof, water resistant, and the most compact option ever made. The incredible print quality ensures a strong and lasting for long time. - Choose black, grey, or brown for bag. Catering to the requirements of our clients, we are involved in offering Ladies Braided Leather Belt. Braided leather belts are one of our specialties where in leather is braided and given shape along with fixing them with perfect sized buckle. They are stylish and classy which makes them appealing to everyone. Our wide range of braided leather belts is available in various shapes, sizes and vibrant colors. We are one of the leading manufacturer of Leather belts since past 2 decades, our unit is well equipped to manufacture 20, 000 units of Leather belts. Our manufacturing unit comprise of latest technology Italian machines and highly skilled professionals. We focus on high quality finishing and on time delivery. 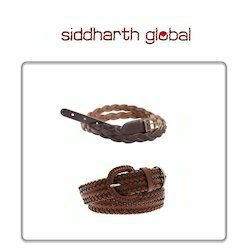 We offer our clients Leather braided belts that are precisely made from high grade quality material. These belts are vey stylish and gives an elegant look to the wearers. With the help of such products we have been able to gain and maintain a huge client base. 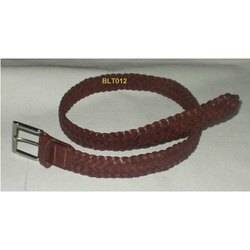 Owning to our rich experience in this domain , we are engaged in manufacturing and supplying wide assortment range of Braided Leather Belt. These belts are manufactured using high grade raw material and under guidance of our experts. Adding more, our entire range is widely appreciated for its durability and excellent finish. Furthermore, we offer these belts at market leading prices.